Asahis first PP SLR and Japans second. 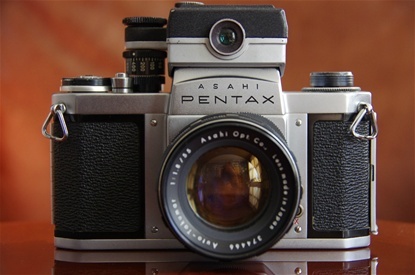 A beautiful camera that was to become a model for cameras for the next 20 years. Produced in a number of 19.600. Mine wears the sns. 136123, 140470, 142306, 144172, 147570 (pictured here), 147589, 149182 and 151851. The unofficial name of this Queen is The Original, or simply AP. Size: 145x92x50 mm. 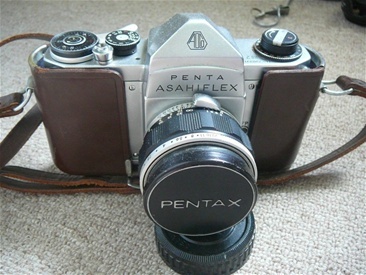 Weight: 580 g.
The superb Pentax layout - in stereo.. 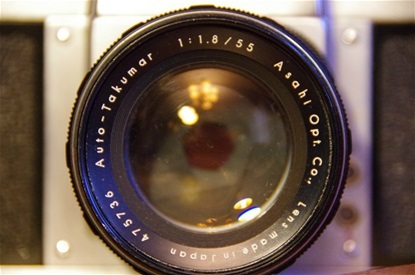 The first series of Asahi lenses were named Takumar. 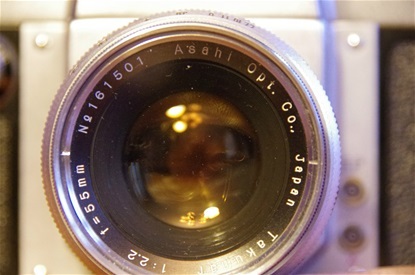 With the Asahi Pentax came 3 standard lenses, 55/2,2 , 58/2,4 and 58/2 , of which the 55 was the more common. For more information about Takumar lenses, see Takumar chapter. 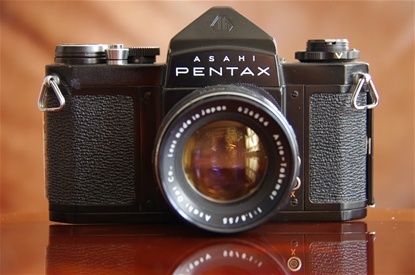 The famous Asahi Pentax layout: Winder arm, not knob, to the right, shutter release button in front, time setting wheel behind, and an unfolding rewind crank to the left. 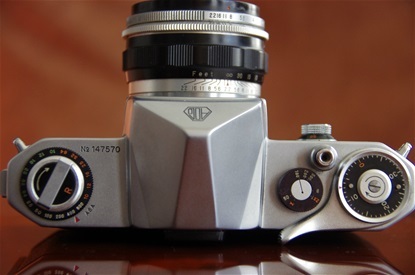 This was to be the model for other cameras for the next 20 years or more. The winder of the AP is still the smoothest you can find. Featherlight. 4 of my 8 APs. SNs: 142306, 144172, 147570, 151851. 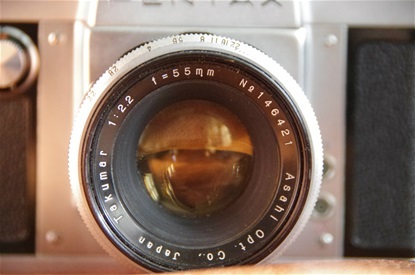 Lenses: Takumar 58/2,4 - 55/2,2 - 35/4. 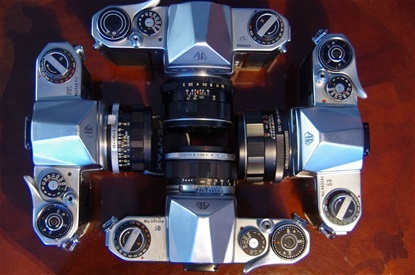 In addition to these there is a 136123, a 147589, a 149182 with a rare 58/2 lens and a Tower 26 (140470) with a Takumar 135. 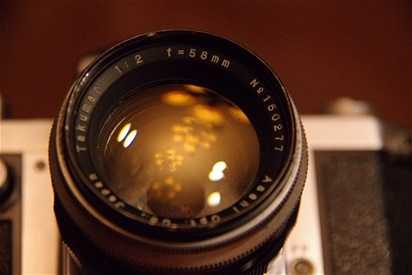 An AP with the rare Takumar 58/2 lens. Still a small company, Asahi was flattered as the US distribution company Sears&Roebuck wanted to distribute the upcoming new Japanese brand of Asahi. 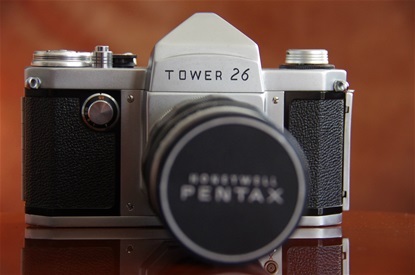 Their brand name in the US was Tower, so this Asahi Pentax was named Tower 26 in the US. Sn: 140470. 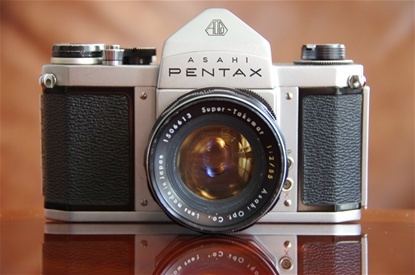 Asahi Pentax S came almost a year after the original. The only significant improvement was the shutter speeds changing from 500-200-100-50-25-10-5-2-1 to the more mathematically correct 500-250-125-60-30-15-8-4-2-1, as had become more common at the time. Besides, the inner base and right side wall was prepared for the actuator that was to come with the K model two months later. These differences is described later. Another small change was the design of ASA values on the dial around the rewind crank. The AP had ASA engraved on the top plate of the body, while the S had it written on the ASA dial. The whole range of pre-Spotmatic PP SLRs has been named the S-series. 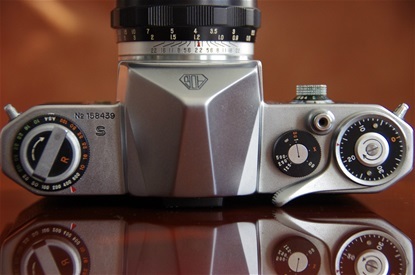 My first S model camera has sn. 158439. Size: 145x92x50mm. Weight: 580 g.
More Takumar lenses were introduced with the S. Among them, a 55/1,8 that is very rare today. Not in my collection at the moment. Here is the more common 55/2,2. Sn. 161501. The same set up as the AP, only the shutter speeds are changed, plus a different ASA value design, as described above. 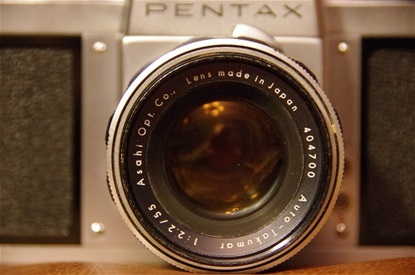 A very rare black Pentax S. Less than 10% of the production was black, so only some 400 were ever produced. Finding mint condition samples is almost impossible as the black paint is much more subject to visible wear than any silver body. Sn. 156197. 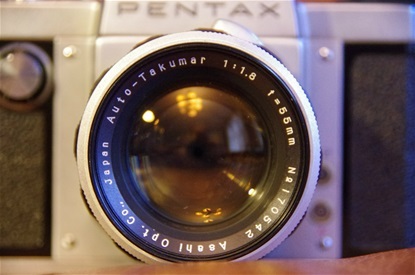 The Pentax S with Takumar 35/4. 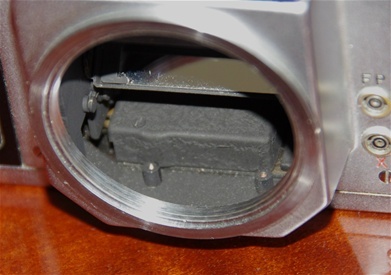 Inside of AP, S and K.
AP: a clean box. Made for moving the mirror. S: A new house, prepared for the actuator that came with the K. Two standing cylinders with internal threads at the base plate, room at the right wall for the mechanism to move. K: Actuator for semi automatic diaphragm explains the changes on the S.
Asahi Pentax K, some sources say for King, others say Kilo (1000, referring to the shutter speed) was released less than two months after the S, and was Asahis first with a shutter speed of 1/1000 sec. But more important was the new set of lenses that came with it, the Auto-Takumars, giving you a semiautomatic diaphragm. 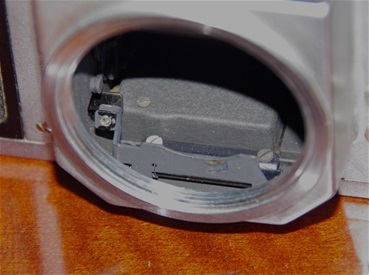 When pushing the trigger,the aperture of the lenses were set by a pin that was pressed by a moving part, an actuator, just inside the mount of the camera. Size: 145x92x50 mm. Weight: 586 g. Sn: 168193. 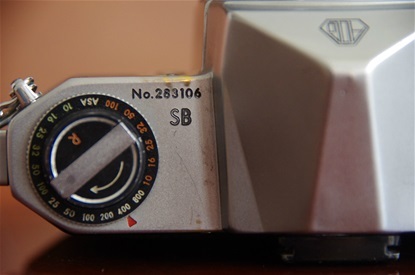 The Auto-Takumars were equipped with a pin that was moved by a small plate in the camera. 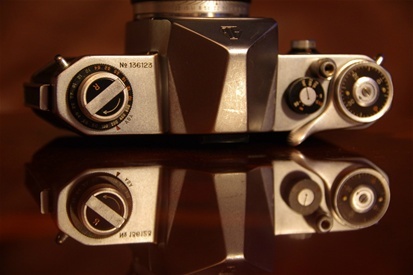 Thus there was a direct link between shutter and lens, and the aperture would be set to the preset value as the picture was taken. Read and see more under Takumar chapter. 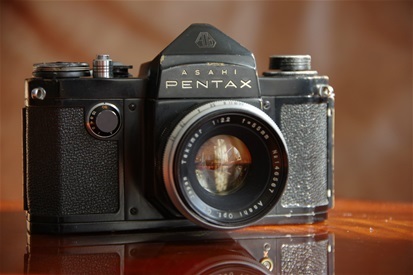 The K was the last Pentax where long and short shutter speeds were operated from two different knobs/dials. New from the S was the 1/1000 shutter speed. Besides, there was more black and less silver on winder and rewinder. 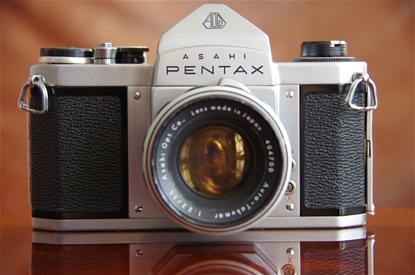 The Asahi Pentax S2 for Japan and general international market, Asahi Pentax H2 sold in several markets, Honeywell Heiland Pentax H2 sold in the US, later branded Honeywell Pentax H2, Asahi Pentax SB, B instead of 2, being the second letter in the alphabet,sold only in Japanese military camps, (from 1961 also the very rare SB2, a special version of the S3) and Asahiflex H2 sold in South Africa, possibly also in Finland. 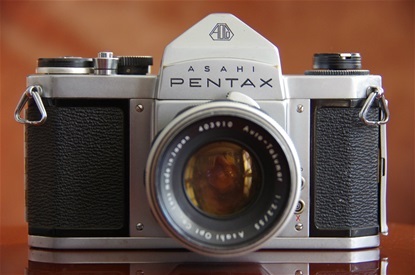 However, although not mentioned in literature, there was even an Asahi Pentar H2 AND a Penta Asahiflex H2 produced for the South African market, maybe also sold elsewhere. 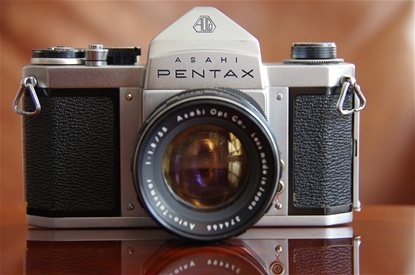 In addition to this, another Asahi Pentax S2 turned up a couple of years later. 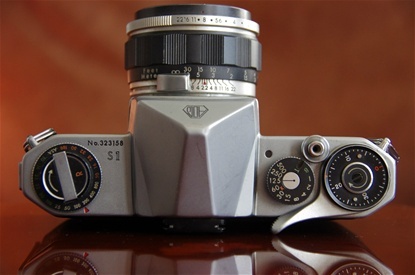 It was made only for the japanese market and was called the S2 Super, although "Super" was not engraved anywhere on the camera. 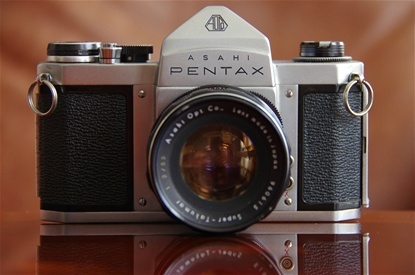 1959: Asahi made their fourth PP SLR, the S2, before Nikon and Canon made their first. Size: 145x92x49 mm. Weight: 580 g. Sn: 246400. 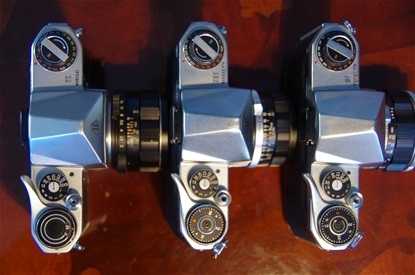 The S2, as H2 and SB, came with Auto-Takumar 55/2. Here sn: 404700. 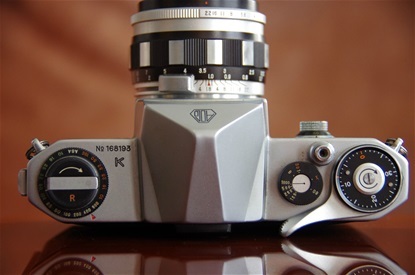 A little redesign from the K: All shutter speeds in the main dial: 1/500 to B. 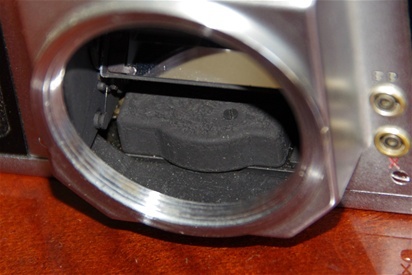 The dial was sturdier and did not rotate during exposure. The small window top left of the shutter dial showed a red dot if the winder was cocked. 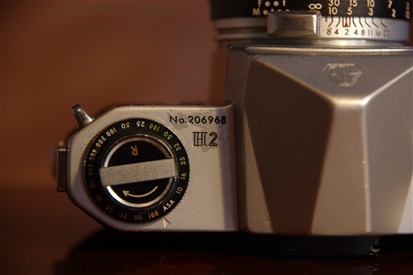 The H2 was mostly produced for the American market under the Honeywell-Heiland brand. But some Asahi branded H2s, like this one, were also produced, mostly distributed in Europe. Sn: 207860. From the north american market: the Honeywell Heiland branded H2. As on most black edition cameras, this sample has some brassing. Even some dents. The house as well as the lens barrel were extremely dirty when received, but some cleaning helped. Shutter was stuck, too, but it is slowly recovering. Sn. 223824. 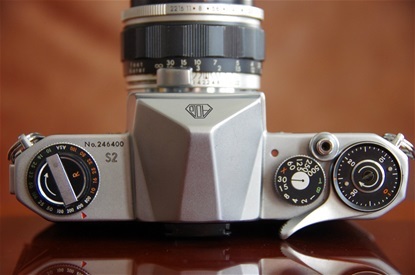 As on all standard S2/H2s, the lens is an Auto- Takumar 55/2. Sn. 270863. The Asahi SB was a S2 sold only in Japanese military camps. Rare. Sn: 283106. 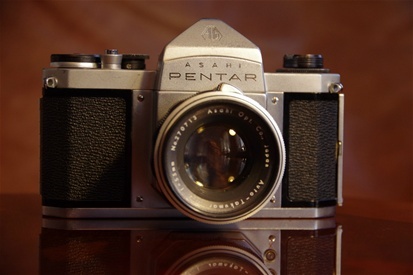 This is one of the rarest Asahi cameras: The Asahi Pentar H2. 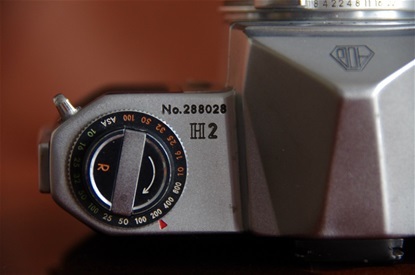 It wears a low sn., 206968, and was one of the very few S2/H2 cameras made solely for the South African market, where VEB Pentacon still owned the right to the Pentax name. 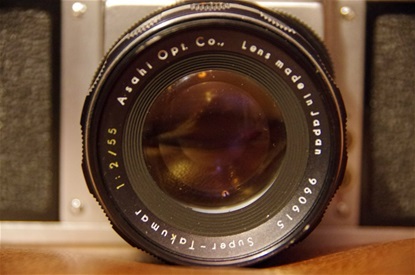 Although S2 was the international model name, Asahi chose H2 as model name on all cameras sold in special markets, the biggest being the north American. This is the Pentar H2. 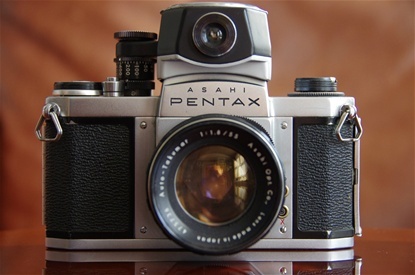 For the odd markets where Pentax brand still belonged to Carl Zeiss/Pentacon. South Africa being one. This one was the middle version with VERY few samples produced. Not of my collection. I was two seconds too late with a winning bid... Next chance will be in 2050? Anyway, congratulations to the one who got it! 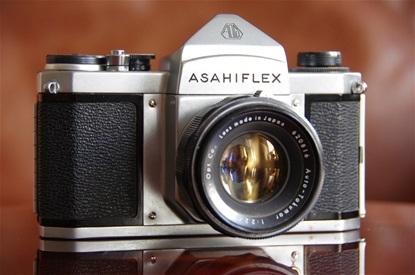 Another rare sample, the Asahiflex H2. 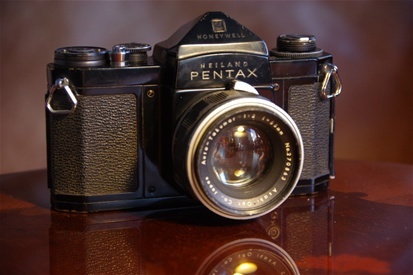 As Pentacon owned the rights to the name Pentax in some small markets, only South Africa is known*, Pentax had to sell their cameras under another brand name until they had come to an agreement with Pentacon of East Germany. The AP was not exported there, but the S and K (and some early H2s!!) were sold as Pentar, later as Penta Asahiflex, while most H2s were sold as Asahiflex, like this sample with sn: 288028. Lens on this one was a Auto-Takumar 55/2,2, sn. 620816, probably not delivered with the camera originally, as standard lens for S2/H2 was 55/2. *According to a manual following S2 from 1959, the same regulations covered Finland, too. This is, however, not sited elsewhere in elder literature. But if so, did it stop there? Something to dig into. Some time. Branded Asahiflex, but otherwise exactly like the S2/H2. Sn: 288028. Two of the three H2 models made mainly for the South African market. 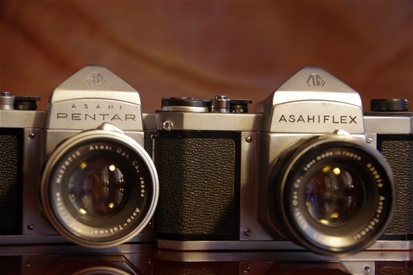 It is amazing that Asahi produced three special model names for such a small market. Each of these are very rare. 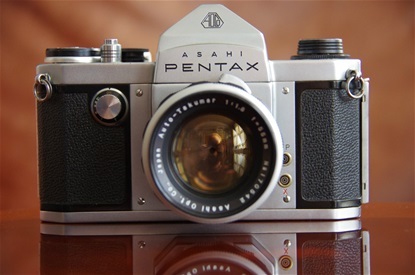 The Asahi Pentax S3 was first shown at Photokina in 1960, together with the revolutionary Spot-Matic. 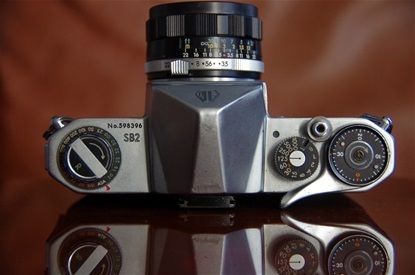 Produced from 1961, it featured a 1/1000 second shutter, as opposed to the S2 with only 1/500. However, some early S3s had 1/500. Sn. 512706. Size: 144x92x50. Weight: 580 g.
On the front of this lens is written: Auto-Takumar. But in reality, this was the first Super-Takumar with automatic diaphragm! Sn. 475736. This very rare SB2 was, as its elder cousin SB, sold only in japanese military camps. 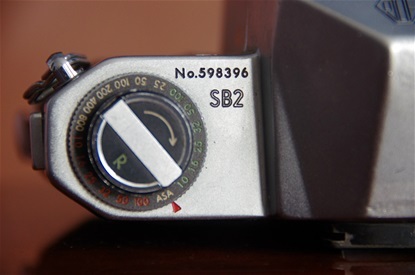 As the SB was a S2/S1 special version, the SB2 was a S3 version with shutter time to 1/1000 and prepared for the Light Meter. I have never noticed any of its kind on ebay. I found this sample in the Philippines. Sn. 598396. 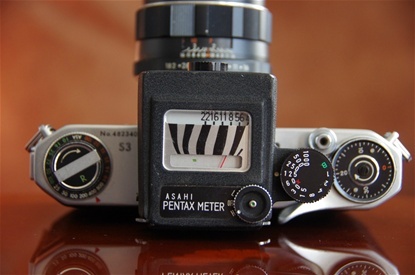 With the S3 came the Asahi Pentax Meter. This CdS driven external meter measured the light more directly towards the motive than the selen cells on cameras before. Here is first version. 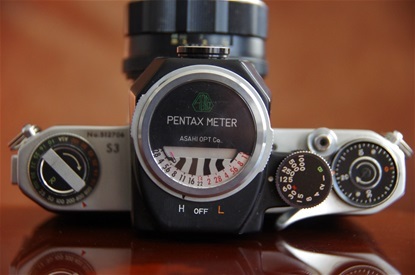 Second edition of the light meter. The shape is more square. 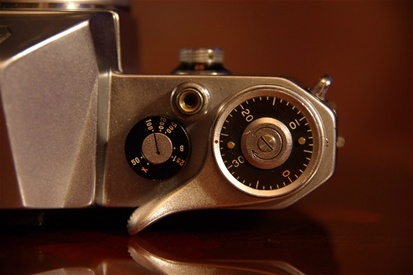 The meter was placed on top of the camera and the shutter dial on the meter was directly connected to the dial on the camera via a pin and a hole. 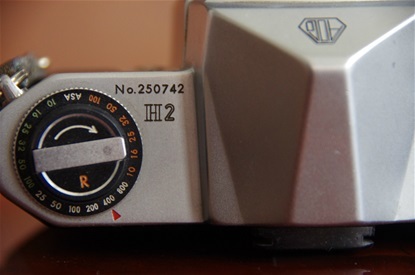 When having preset the ASA and the shutter time, the meter would point out the correct aperture. It works well! The S1 was the little brother of S3. The house was identical to the late version of S2, and it was produced to meet a lower price range. With 1/500 shutter speed and a 55/2,2 lens, it was the answer for those who could not afford the top model. Otherwise no external difference. Sn. 323158. The slower shutter speed of 1/500 was the only visible difference from the S3. 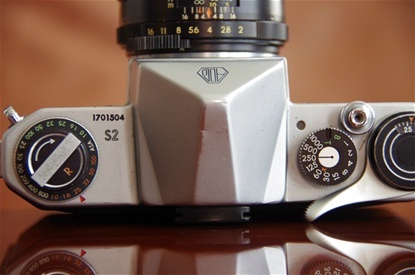 SV was the last top model of the S-series, the pre-Spotmatic cameras. I featured a new selftimer, the first and last to be placed on the top plate as a wheel under the rewind crank. You turned the wheel sun wise, pushed a release button, and the wheel would turn some 10 seconds until the V-mark on the wheel was pointing forward, and the picture was taken. Here one of my six SVs, sn. 797632. Size: 144x92x50. Weight: 590 g.
Here a Super-Takumar 35/2,8 lens. 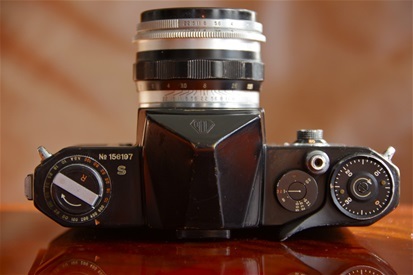 The ordinary lens to follow the camera was a Super Takumar 55/1,8. 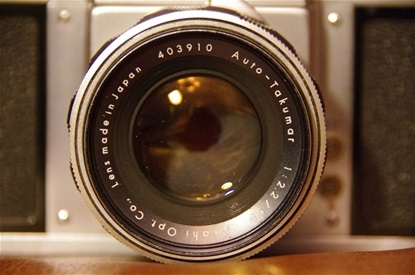 The later versions were constructed to allow the new 1,4 lens. Some news: Selftimer wheel to the left, release button behind the SV name, exposure counter on top of winder was redesigned. Note the "cold" flash shoe that was to be mounted on the viewer. 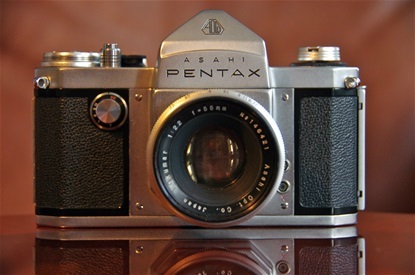 Most Asahi Pentax cameras were silver Kings. Here is a black Queen. Sn. 629300. S1a was the economy version of SV. It missed the self timer, the 1,8 lens and, officially, the 1/1000 speed. No self timer wheel under the rewind crank, no 1/1000 speed marked on the shutter time dial. But: when you passed the 500 mark there was another click, and the camera did fire at a faster speed, though not factory tuned in to precisely 1/1000 sec, as that would cost time and money. The whole idea of the S 1a was to make a less expensive production, and it would be more expensive to start production of some new parts to take away the fastest speed than to just use the same parts they were already producing for the SV. The same strategy was used for the S3/S1 and the Spotmatic/SL/SP 500. Neither S1 nor S1a were sold in Japan. They were replaced by a camera called S2 Super. 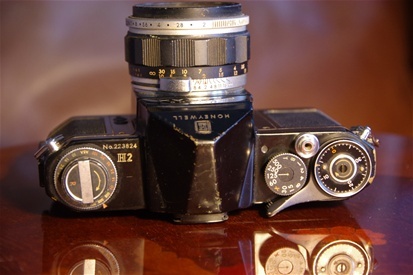 But the only model name on the camera is S2, the same name that was introduced in 1959. 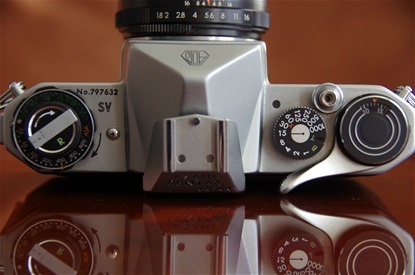 This camera is supposed to be identical to S1a, still the speed dial is marked with 1/1000 as its fastest, while the original S2 and the S1/S1a shows 1/500 as top speed. 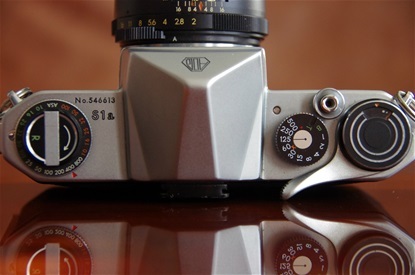 It is in fact either an S3 with the new SV frame counter, or an SV without self timer. S2 is the name, but the serial number tells you it is not the 1959 edition. And note the 1/1000 step on the shutter dial, which tells you it is not the later 1962 version. It is either a S1a with 1/1000 or a mix of S3/SV. Sn: 1701504. 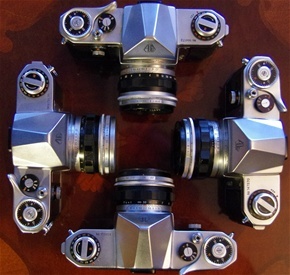 The three Asahi Pentaxes sold only in Japan: S2 Super (SV without self timer), SB 2 (S3) and SB (S2/S1). The SB and SB2 were sold only in Japanese military bases. 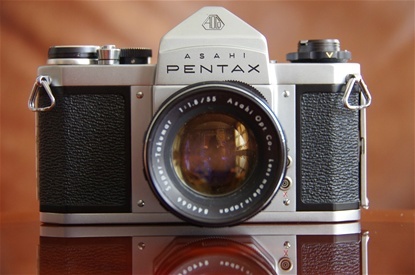 Numbers also include Asahiflex/Pentar/Penta H2 and Pentar branded S and K cameras. Allready film in it. What a shutter sound !!!! Got an SV today, with serial number 808456, worn to patina but super condition,55-1,8 lens. Great! I hope you will use it. Those early ones really excite you when shooting with them! Good luck! Can you tell me about the ISO button ? Some say the whites are for B&W format and greens are for color formated film ? The white scale (25-800) is for B&W, the orange (10-64) is for negative colour film, and the green scale (10-64) for colour slides.Some variations occurred. 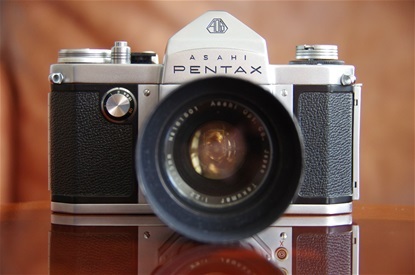 If you are looking for a Penta Asahiflex H2, I have it in mint condition, fully working, with its original leather case and Auto Takumar 55mm f:2. 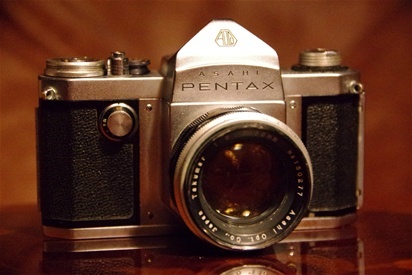 I have a black Pentax S1. Is it rare? All black pre Spotmatic Pentax cameras are rare as only a small portion, less than 10%,came in black. So,next to the AP,S and K,the S1 is probably the rarest.